Japan is a country that is difficult to compare to others. Due to centuries of isolation, its culture, customs and politics have made it very unique. Ever since the American Invasion in the 1800s, however, it has been forced to adapt and change to fit the rest of the world’s mold. This has made its problems, and benefits, far more complex to foreign viewers. One particular question facing the Japanese government and people today is one of militarization. After World War II, America had full control over the nation of Japan. The former Imperial government had signed a treaty of unconditional surrender after the horror of two atomic bombs shaped and continues to shape Japan’s collective psyche today. America could’ve done anything it wanted with Japan. It could’ve destroyed it financially, annexed it militarily or made it into a prison island unethically. The Americans chose a more peaceful option, rebuilding it in the shape of an East Asian trading partner and ally. Granted, this was mostly in opposition to the neighbouring Soviet Union, so as to surround it, but it’s effects were only positive to the Japanese. To control the growth of Japan, America helped write its constitution. One of the clauses in the constitution, Article 9, stated that Japan would renounce all forms of warfare as a means of settling international disputes (although Japan got around this with the SDF, Self-Defense Force. A peacekeeping military of sorts). In return, Japan gave America army bases within its borders, meaning a substantial amount of the military presence in Japan today is American, not Japanese. The Article has come into question recently for several reasons. One is deteriorating relations with China. China and Japan (as well as other nations) have disputed the ownership of many pacific islands, chief among them, the Senkaku/Diaoyudao/Diaoyutai islands. The Senkaku islands are a series of uninhabited islands in the East China Sea, claimed by Japan, China (who name them Diaoyudao) and Taiwan (Diaoyutai). China’s claim on the Senkaku islands is based on the fact that they were discovered by Chinese sailors in the 14th century (as Taiwan was historically a part of China, it uses the same claim). Japan ruled the islands from 1895, but may have lost control over them during the signing of the peace treaty to America in 1945 (the wording of said treaty is unclear). China has been increasingly aggressive in pushing its claim on the archipelago, building artificial islands in the East China Sea to push its maritime borders to include the islands. Artificial islands are somewhat new and a rarity, thus their application in international borders is unclear. Many in Japan wish to secure the islands utilizing a military force, which would be in direct conflict of Article 9. Another reason for militarization (albeit a far more recent and less far-reaching one) is the expansion of ISIS. ISIS kidnapped two Japanese citizens and ransomed them to the Japanese government. 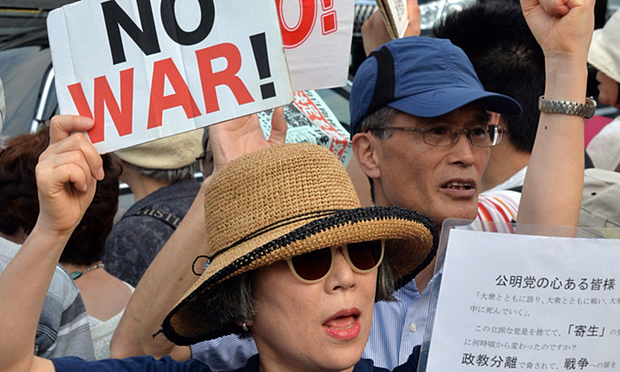 Many called for Japan to join the US led coalition against ISIS. But because of its constitution, it couldn’t. The ransoms were paid, but at the expense of funding ISIS, a cutting blow to Japan’s self-esteem. A final reason for militarization is South Korea. Because of South Korea’s war with North Korea, it has built up a powerful military and navy. This is at a time when anti-Japanese sentiments in Korea are at a high, making many Japanese feel threatened. After all, not all of Korea’s military surrounds the border, some of it patrols the North China Sea, potentially threatening Japan. Other nations militarize, why can’t Japan? The current majority party, the LDP (Liberal Democratic Party), headed by Prime Minister Shinzo Abe, has sought a reinterpretation of the constitution. They have said the treaty forbids any offensive wars of any kind, but does allow for “collective self-defense”, meaning that Japan would be allowed a military presence, but would only engage in wars in which either it or an ally were invaded. This has angered their rivals, the Japanese Socialist and Communist parties. Most people’s standing on Article 9 can be placed into four distinct categories. Pacifists, who want all forms of the Japanese military disbanded. Mercantilists, who believe a small military should be maintained for peaceful purposes and economic stimulation. Normalists, who want the clause rewritten to allow for a greater army to maintain “international peace and security”. Nationalists, who wish for rearmament and development of nuclear arms and warheads. A lobby group called Nippon Kaigi has called for the abolishment of Article 9 and the return to Imperial Japan, including the raising of powers for the monarchy and making Shinto the national religion (despite the fact that half of Japan is Buddhist, and most Japanese adhere to both Buddhist and Shinto ceremonies) Nippon Kaigi is a very influential group, with 15 out of 19 cabinet ministers in Shinzo Abe’s government being affiliated. Another growing debate that surrounds remilitarization is that of the Nazi problem. Perhaps Nazism may seem out-of-place in Japan, (considering that, according to Nazism, the Japanese are an inferior race) but it exists and it’s growing. It is a form of Nazism that adheres to its name, National Socialism (NAtionalsoZIalismus in German). The Japanese form of Nazism believes in a fascist regime that is militaristic and vehemently anti-Korean. They believe in remilitarizing Japan. Their racism pertains mostly towards Zainichi (or ethnic) Koreans. 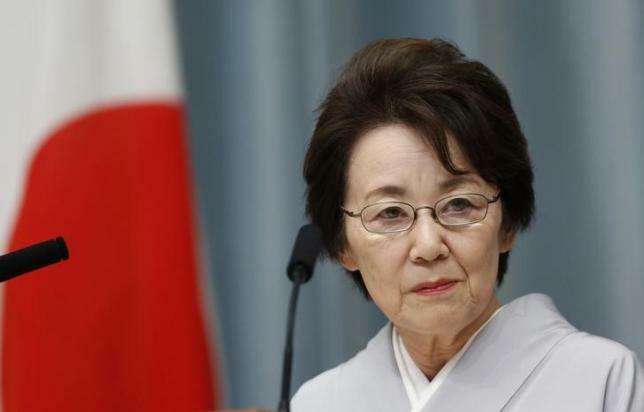 One infamous example of a Japanese Nazi included a member of Abe’s government, Eriko Yamatani (Chairwoman of the National Public Safety commission) refusing to condemn a group called Zaitokukai, a nationalist organization that has called Koreans by the offensive term “Gokiburi”, literally “cockroaches”. A photo later surfaced of Yamatani with the leader of Japan’s Neo-Nazi party, a party that frequently uses the term. Abe removed her from office soon after. Many questioned that if members of the Prime Minister’s cabinet believe in some Neo-Nazi beliefs, do they also believe in others (i.e. full remilitarization)? Technically the LDP adheres to a normalist view of Article 9. However, some have posited that many members actually believe in the nationalist view of Article 9, but merely say they are normalist to get more votes. Most of Shinzo Abe’s Western attention has been about his disciplining of his party when they stray too far to the right, either in their views on military, race or women’s rights. Is Abe trying to control an increasingly radical party? Is he just like them, but good at hiding it? Or are they right? 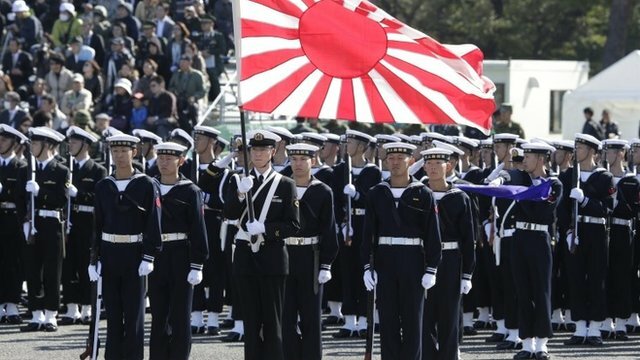 Should Japan remilitarize? After all, it could benefit from the increased growth, press its international claims and maintain peace more effectively. Japan is in a precarious position. This article began by pointing out that Japan is incomparable to other nations, that its history is unique. Yet, this very era of Japanese politics is comparable, specifically to the American Invasion of Japan in the 1800s. It was faced with the tough question, should it adapt to other parts of the world, even if the rest of the world is misguided? Should it hold onto its traditions, even if it means other parts of the world can get the better of it in certain aspects? The question is essentially between morals and competition, and which is more important to Japan. That is something only the Japanese public can decide. The pacific islands, the Ocean and the nation in it were named Senkaku, Taiwan and the North/East China Sea for simplicity reasons. The Update does not take any sides in the pacific islands dispute or other ones in the region. Sources include IAC/InterActiveCorp, The Guardian, Wikipedia and the Discovery Network. The information presented in this article does not necessarily reflect the views or beliefs of The Update. We are reporting either the facts or opinions held by third parties related to the subject of the article. Posted in World and tagged featured, Japan, politics. Bookmark the permalink. Opinion: Why Do We Continuously Allow the Sexualization of Underage Boys at La Chat? Fashion Show 2019: Four More Days!